We got an email a few days, and just heard loud-mouth host Shawn Killinger announce it, that QVC has renamed its spinoff network QVC2. It used to be called QVC Plus. The email said to tune in for live shows, favorite brands and hosts, and the QVC2 Big Deal, apparently its Today’s Special, which debuts at 9 p.m. every night. We broke our ankle a year ago, and HSN host Colleen Lopez has had a similar mishap. On Facebook Lopez posted on Thursday that she had suffered a fractured elbow. She tripped over her pooch. HSN host Colleen Lopez is on the mend. 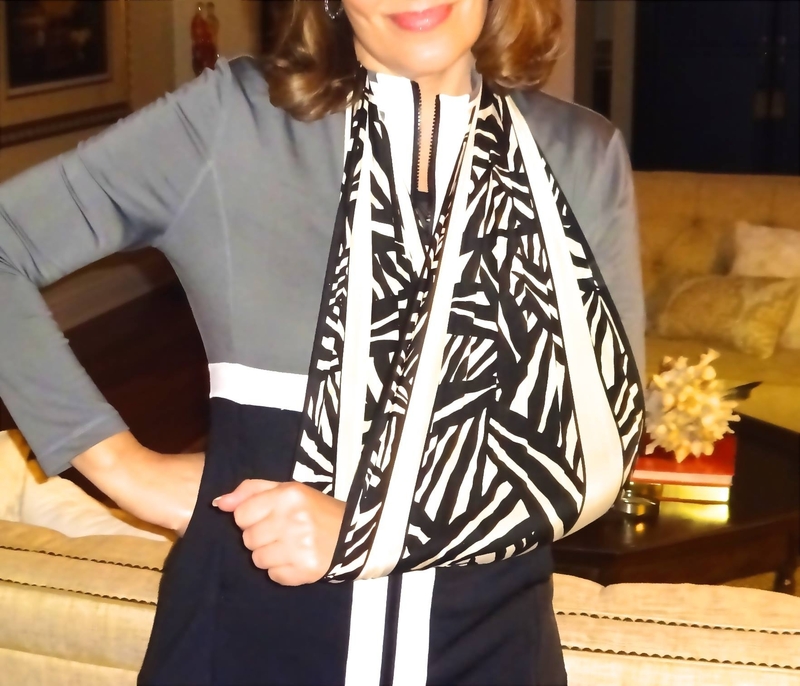 She then posted a photo of her arm in a stylish sling with a graphic black and white print. Lopez also posted a photo of “the culprit,” her Yorkie Sophie. “I tripped and fell over Sophie the other day when I arrived home from work (no kidding),” Lopez wrote. We wish Colleen a quick recovery. On Christmas Eve we blogged about HSN queen Joy Mangano bringing her products to Macy’s. We didn’t have to be a genius to figure it out, since the brick-and-mortar retailer was running ads in The New York Times about it. It seems to us to be a unique move on the part of a home shopping network, to have one of its key vendors also featured at Macy’s. But remember that HSN owns Mangano’s company, Ingenious Designs, so sales from Macy’s should trickle back to Mindy Grossman and her crew. And we guess HSN wanted to strike while the iron, or Little Steamer, is hot, with Mangano getting a lot of press since the release of the film “Joy,” which is loosely based on her life story. Joy Mangano and her Little Steamers are coming to Macy’s. In any event, Macy’s Tuesday finally got around to doing a press release about its pact with Mangano. And the entrepreneur will be appearing at Macy’s Herald Square in the Big Apple this Saturday, Jan. 9, for the big launch. NEW YORK–(BUSINESS WIRE)–Launching on Jan. 9, the award-winning Joy brand will join the roster of Macy’s Home Store, offering innovative products that make a difference and simplify everyday challenges. Fueled by the breakout success of her first product, the Miracle Mop®, Mangano has spent the last 30 years creating solutions that make people’s lives easier, which inspired the star-studded film, “Joy,” by 20th Century Fox that released on Christmas Day. The product line at Macy’s will include Miracle Mop®, Huggable Hangers®, My Little Steamer®, Better Beauty Case, MemoryCloud Pillow, and Forever Fragrant® Vase and Sticks. Joy will make an appearance at Macy’s Herald Square store in New York City on Jan. 9 – the day the brand launches nationwide. An expert in designing, inventing and marketing innovative products for live content retailer HSN for more than 15 years, Joy holds more than 100 patents and trademarks. The collection starts at $29.99 and will be available in Macy’s stores nationwide and on macys.com. For Joy’s videos and tips, please visit macys.com/joymangano. Ingenious Designs LLC (IDL) is a subsidiary of HSN, Inc. and was founded in 1991 by its president, Joy Mangano. Joy is one of the most recognized inventors, entrepreneurs and product designers in the industry today and she is the creator behind innovative products such as the Miracle Mop®, My Little Steamer®, Huggable Hanger®, Comfort & Joy Memory Cloud™ Pillow, Forever Fragrant® and the Better Beauty Case. IDL also manages product lines for icon and celebrated supermodel IMAN, celebrity chefs Ming Tsai and Lorena Garcia, GRAMMY Award®-winning producer Randy Jackson, and Four-time GRAMMY Award®-winner and American Idol judge Keith Urban. We gave you QVC’s Christmas plans, so we’re giving you those of Jewelry Television, which came out when we were on vaca. KNOXVILLE, Tenn., Oct. 29, 2015 /PRNewswire/ — Jewelry Television® (JTV), the only shopping network focused exclusively on the sale of fine jewelry and gemstones, announced the launch of its national Let It Glow holiday campaign. The promotion features JTV’s 2015 holiday collection, gift giving ideas and the chance to win a romantic Alaskan cruise getaway for two. JTV’s Let It Glow campaign runs now through Dec. 25, with special event pricing on some of the season’s hottest jewelry trends including negative space rings, gemstone brooches, statement necklaces and more. Check out more details in the gift guide. The centerpiece of the campaign is the Season To Glow Sweepstakes. The grand prize includes seven nights on an Alaskan cruise, two nights in Seattle, Wash., and $1,000 cash. JTV will also award $250 JTV shopping sprees to 10 weekly winners. Enter the sweepstakes by visiting JTV.com/glow. Entrants may register to win once daily through Dec. 31, 2015. Following on the heels of HSN’s report, QVC announced Wednesday that its revenue increased 4 percent to $1.4 billion in the third quarter versus last year. Earlier in the day, HSN said that its net sales in the quarter rose 2 percent, to $590.6 million, which was below Wall Street’s projections. At the No. 1 domestic home shopping network, part of Liberty Interactive Corp., units sold rose 5 percent; average selling price per unit increased 1 percent to $58.70; and returns as a percentage of gross product revenue increased 21 basis points. QVC U.S. experienced growth in the apparel, accessories, home and beauty categories, which was partially offset by a decline primarily in jewelry. Ecommerce revenue increased 15 percent to $678 million and was up 48 percent from 43 percent of total QVC revenue. Adjusted OIBDA increased 1 percent to $333 million and adjusted OIBDA margin decreased 55 basis points to 23.5 percent. These results were primarily due to higher freight and inventory obsolescence expense, which were partially offset by higher product margins and lower bad debt expenses. “QVC generated strong results across the board with local currency growth in all consolidated markets for the second quarter in a row,” Liberty Interactive President and CEO Greg Maffei. The entire QVC group, which includes Liberty Interactive’s many international home shopping networks, saw its consolidated revenue drop 1 percent, to $2 billion. “U.S. dollar denominated results were negatively impacted by exchange rate fluctuations in the third quarter,” QVC said in its press release. The Dollar strengthened against the Euro, Japanese yen and British pound sterling 16 percent, 15 percent and 7 percent, respectively. On a constant currency basis, consolidated revenue increased 4 percent and adjusted OIBDA increased 1 percent compared to a 1 percent and 2 percent decline in dollars, respectively. Excluding the costs related to launch QVC France, consolidated adjusted OIBDA increased 3 percent on a constant-currency basis in the quarter. “We delivered strong constant currency revenue gains across markets as we continued to execute our strategies to extend our leading global video and eCommerce position,” QVC President and CEO Mike George said. “We expanded our commerce platform reach with additional TV carriage and increased digital penetration, and mobile orders now represent over 50% of all eCommerce orders,” he said. 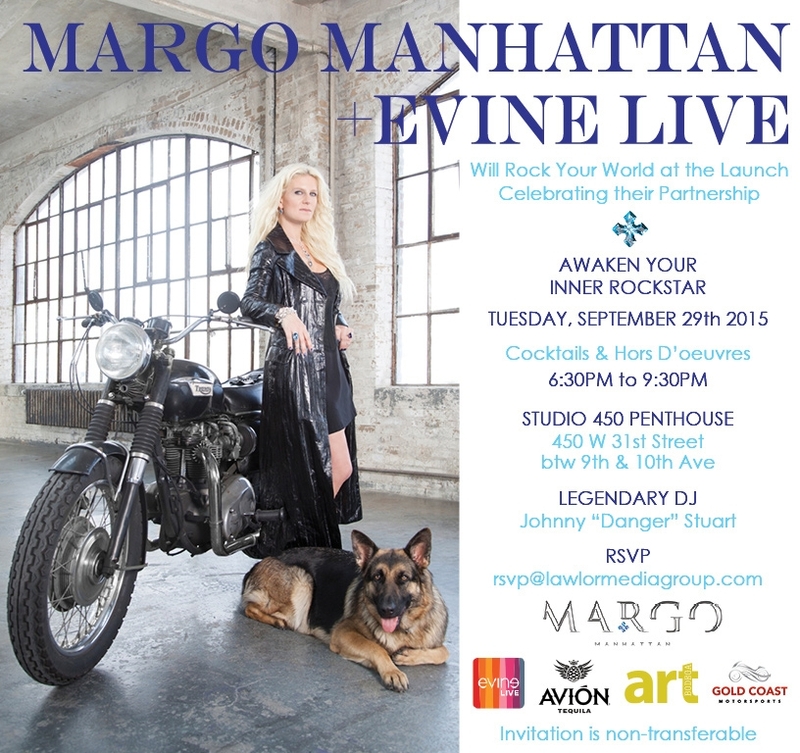 We were not able to attend last week’s launch party for jewelry designer Margo Manhattan’s new line for Evine Live. But we got a press release on the festivities. Damn, we missed the free tequila! Manhattan’s collection will debut on the home shopping network on Nov. 4, and we can’t wait. She’s into chunky crosses and so are we. Models dressed in rhinestone studded Team GOGO Tee’s and Margo’s latest collection served a selection of hors d’oeuvres generously provided by New York restaurant The Marshal and cocktails from Avion Tequila, Nuvo, Elite Vodka and Birthday Cake Wines lined the bars. Throughout the night, DJ Johnny ‘Danger’ Stuart who rocked the party with an eclectic mix of rock ‘n’ roll classics and today’s hits. The event featured a surprise performance by singer Josh Shapiro, who performed three songs including a cover of ‘You Raise Me Up.’ Following his performance, CMO of EVINE Live Penny Burnett addressed the crowd, and formally welcomed Margo Manhattan to the EVINE Live family. Margo Manhattan is set to Launch on EVINE Live on Wednesday November 4th, 2015 at 1:00 PM EST and 5:00 PM EST. Margo’s cutting edge jewelry, previously available only at her exclusive Madison Avenue boutique, will now be available to 88 million viewers on cable and satellite, both on TV and online at EVINE Live debuting on the channels. Margo joins EVINE Live’s elite roster of celebrity and designer lines which include: Marc Bower Unlimited, NV by Nick Verreos, Countess Luann de Lesseps’s clothing line and celebrity chef Todd English. In addition, the new MARGOMANHATTAN.COM website launched the night of the event with her latest Collections. Visit the Margo Manhattan Boutique Madison Avenue on 88th Street’ her beautiful jewel box shop on the Upper East Side, to experience the full breadth of her unique collections. While you’re there, do not miss The Vault, a stunning collection of unique one-of-a-kind pieces, featuring diamonds, emeralds and sapphires, all set in white and yellow gold. We were too busy working our butts off at our real job last week to notice that model Cindy Crawford, who went to our alma mater Northwestern, did a drive-by at Evine Live to hawk her new book. Here is Evine Live’s press release in advance of her appearance. MINNEAPOLIS, MN–(Marketwired – Sep 30, 2015) – EVINE Live Inc. (NASDAQ: EVLV), a digital commerce company (evine.com), today announced that American icon and supermodel Cindy Crawford will appear on EVINE Live October 1st at 9pm ET to discuss “Becoming,” her new book just released yesterday. In addition to offering the book for sale, Cindy will give fans a unique look into the pivotal points of her life and career in an EVINE Live-exclusive interview. Cindy Crawford promoted her new book on Evine Live last week. The interview will appear on EVINE Live Thursday, October 1st at 9pm ET. 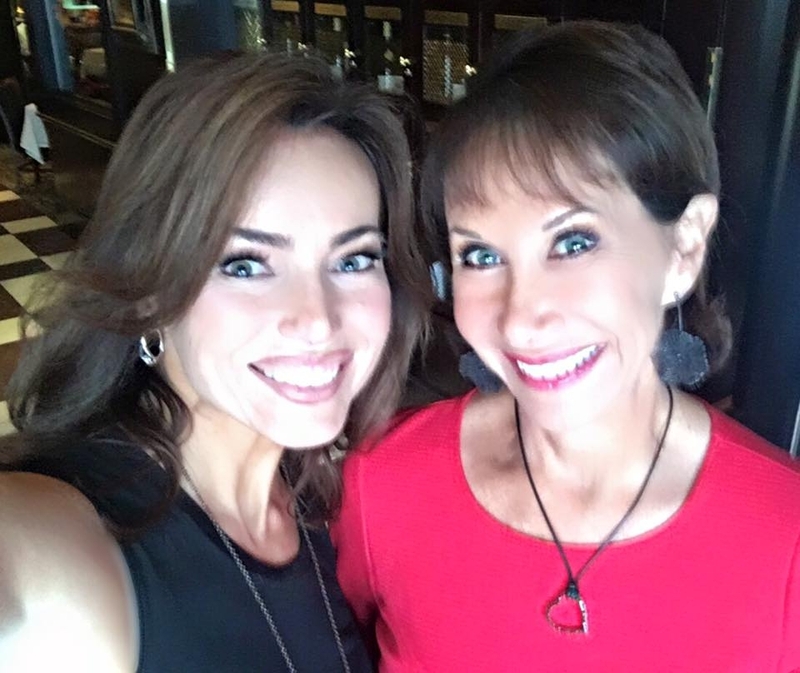 During the segment, Cindy will be joined by EVINE Live host Heather Hall and Sonia Kashuk, her life-long friend and internationally known makeup artist. Filmed at Sonia’s New York City studio, the three will talk about Cindy’s new book, her life, career and feelings about turning 50 next year. Cindy Crawford is one of the original supermodels who defined that pivotal moment when fashion models became cultural stars in their own right. Throughout the 1980s and 90s, Cindy could be seen in virtually every major magazine and fashion runway, working with the world’s biggest brands. In addition to modeling, Cindy is a philanthropist and accomplished businesswoman. “Becoming” is an engaging series of stories that sheds light into the life and work of an extraordinary woman who is as beautiful inside, as out. “Becoming” is a must for anyone who has followed Cindy’s legendary career, is fascinated by the worlds of fashion and photography, and will be a meaningful mother-to-daughter gift for all young women who can benefit from reading this modern-day American success story with universal coming-of-age lessons. The book is illustrated by 150 stunning and iconic images, as well as never-before-published photographs from her personal archive. Evine Live has a new host that jewelry designer Chuck Clemency seems to think is a real pistol: Natasha Chugtal. She made her debut last week. Apparently a woman of color, and the only home shopping network that could use some color more than Evine Live is Jewelry Television, Chugtal is a former newscaster. She left a job at CBS-affiliate WTVY in Dothan, Ala., to come north to Minnesota. Hope she’s ready to freeze her keister off. But we guess it won’t be too much of a shock since she’ apparently a native of the northern state. When Clemency was on-air on Thursday a caller said she was a fan of Chugtal, having watched her on the local TV station. As far as we could see, Evine Line hasn’t added Chugtal to its host listing on its website. Are they waiting to see how she works out. We blogged about HSN and Ford coming up with some kind of deal for car buyers. Turns out you will be able to buy several of the car maker’s top brands at a preset price — in other words, without having to go through that unpleasant process of haggling with a car dealer. The initiative kicked off Saturday, with a final show at 5 p.m.
Our readers reminded us that QVC once had an offer where it worked to sell Saturns, so this is not totally new to home shopping. Here’s what HSN had to say about their partnership with the automaker in a press release. With more women influencing vehicle purchases than ever, HSN and Ford Motor Company are teaming up to offer a new approach to car buying. Now through the end of the month, the ease and convenience of HSN’s shopping experience will be extended to consumers looking to buy a new Ford vehicle. In a study conducted by HSN, while women consumers enjoy the hunt for a new vehicle, they indicated they don’t enjoy the car buying process – specifically, price negotiations. In this exclusive marketing program with HSN, Ford will offer shoppers the opportunity to purchase, with a preset price, some of its most popular models including Fusion, Escape and Edge. The Ford Preferred Price Event, including a two-year complimentary Ford Protect Premium Maintenance Plan, will be available exclusively to HSN consumers through Oct. 31. Top three on her list – The vehicle attributes most important to her are reliability, reputation of quality, and safety rating. She has a say – Nearly all (96 percent) respondents are involved in the vehicle purchase decisions in their households; 44 percent are the primary decision makers. She is a shopper at heart – She enjoys the hunt for a new vehicle; however, the process can be overwhelming at times. She specifically dislikes the price negotiation process. She knows what she wants – When shopping for a vehicle, she tends to know exactly what type of car she is looking for. The campaign kicks off Oct. 3 with three hours of dedicated programming on HSN at 10 a.m., 2 p.m. and 5 p.m. EDT. We hate to say we told you so, but we told you so. We warned you about Jessica Simpson in a recent blog. We missed the Texas blonde’s appearance Thursday night on HSN, but apparently it went about as well as her brief stint on QVC a few years ago. In other words, she was a train wreck. These boots are made for walking, and Jessica Simpson should keep walking away from home shopping. TMZ already skewered Simpson, describing her as “dazed” and “confused” during her HSN debut. “Jessica seemed out of it during her 2-hour sell-a-thon, giggling and slurring,” TMZ wrote. Poor Colleen Lopez! It’s 2 a.m. and we have work tomorrow — or should we say later this morning. So we are just posting this as is. WEST CHESTER, Pa. (September 16, 2015) – As all women know, there is a pair of shoes for any and every occasion. This October, Cheryl Burke is lacing up to support a cause that affects so many–breast cancer. Through her involvement with QVC Presents “FFANY Shoes on Sale,” Burke is striving to prove that great shoes have the potential to make a true difference one step at a time. The annual QVC Presents “FFANY Shoes on Sale” broadcast, which is scheduled to air Thursday, October 22 from 6 to 9 PM (ET), will feature over 150 donated styles of shoes from more than 80 brands. To sweeten the deal, each pair comes with a charitable perk. Shoes will be offered at HALF the manufacturer’s suggested retail price* with a minimum of 80 percent of the purchase price** benefiting various breast cancer research and education institutions, giving shoppers a feel-good reason to make a purchase. As part of QVC’s ongoing commitment to support charitable causes that promote the success and wellness of women through the power of relationships, this event has generated more than $47 million, to date, for breast cancer research and education institutions. Beneficiaries for the 2015 QVC Presents “FFANY Shoes on Sale” event include: The Abramson Cancer Center of the University of Pennsylvania, The Breast Cancer Research Foundation, The Samuel Oschin Comprehensive Cancer Institute at Cedars-Sinai Medical Center, The Susan F. Smith Center for Women’s Cancers at Dana-Farber Cancer Institute, The University of Michigan Comprehensive Cancer Center’s Breast Oncology Program, The University of Pittsburgh Cancer Institute, The Winthrop P. Rockefeller Cancer Institute of the University of Arkansas for Medical Sciences, The Alvin J. Siteman Cancer Center at Barnes-Jewish Hospital and Washington University School of Medicine, and The Margie and Robert E. Petersen Breast Cancer Research Program at the John Wayne Cancer Institute at Providence Saint John’s Health Center. Those wishing to support cutting-edge research at these organizations can go to ffany.org to make contributions and find out ways to join in and be part of this important effort. Ellen DeGeneres, she of the hit daytime talk show, has been slumming at QVC. But now she has also done a deal with tony Bergdorf Goodman, the New York Post reported Sunday. The blonde New Orleans native already hawks her lifestyle collection, ED, on QVC, along with her dog food line. But there was a party last week at the pricey Manhattan Bergdorf’s to kick off the products that DeGeneres will be selling at the store and on its website. According to the Post, Bergdorf will be selling ED goods such as $525 thrown pillows, a considerably higher price point than her home shopping wares. The expensive items will be exclusive to Bergdorf’s brick-and-mortar stores through Sept. 22, and at Bergdorf’s website until the end of the month, the Post said. This is intriguing news from HSN: The home shopping network will be live streaming tennis legend Serena Williams runway show during New York’s KIA Style360 Fashion Week. The “Front Row” stream event will take place on Sept. 15, and HSN will be selling items from Serena’s collection online immediately following the show. “Throughout my life, I’ve always believed in pushing boundaries…whether it’s in tennis, business or fashion!” Williams said in a canned statement. With the ultimate Calendar Grand Slam within her grasp in New York this summer, Williams will partner with HSN and manufacturer Tiger J to present one for her runway show. Before the show, Williams will host a live Q&A via Periscope at 2:30 p.m. where fans can get a peek behind the scenes at the show. The Serena Williams Signature Statement Collection runway show will feature 26 looks “designed for women of all shapes and sizes,” according to HSN’s press release. After the final model walks the runway, Williams will sit down for a brief chat via Periscope to answer questions from fans and announce a special social contest in which fans can win a one-of-a-kind couture piece from the collection. Available exclusively on HSN.com both during and immediately following the show, the collection will include 14 styles, such as faux shearing jackets, color-block knit sweaters, tunics and printed jogger pants. Prices range from $29.90 to $129.90. The Serena Williams Signature Statement Collection Fashion Show will take place at KIA STYLE360, 639 West 46th St., at 3 p.m. Sept. 15. The tennis queen will be on HSN on Sept. 23 to present her Serena Williams Signature Statement Collection live starting at 12:01 a.m. as part of the network’s Fall “Fashion Edit” series. Jewelry Television is partnering with Beads of Courage Inc., a non-profit organization that has a program we’ve never heard of but sounds very intriguing. Children coping with serious illnesses receive special beads from their nurses and caregivers, with each bead representing a step in that child’s treatment. The idea is to honor their courage as they hit milestones. During September, JTV is inviting its national audience to help seriously ill children be able to tell their story of courage. “We are inviting our customers to support the mission of Beads of Courage by calling in or going online to donate, regardless of a purchase,” Jill Johnson, JTV’s vice president of marketing, said in a canned statement. A year ago, with donations from its audience, JTV raised $59,000 to benefit Beads of Courage. Through its efforts, the network was able to help establish three Beads of Courage programs at the East Tennessee Children’s Hospital. Since 2005 Beads of Courage has been working to transform the treatment experience for children coping with chronic, life-threatening illness through Arts-in-Medicine programs. There are Beads of Courage programs in more than 250 hospitals worldwide. According to research, the program offers a coping strategy that helps children move through their treatment and helps them communicate with others. On average, most children have more than 500 beads in their collection. The Program helps clinicians at the bedside feel better equipped to support the emotional needs of children. JTV is inviting artists and the public to contribute to Beads of Courage through National Bead Challenge Day on Sept. 19. National Bead Challenge Day will honor the brave children suffering from serious illnesses by helping to fulfill their Dream Bead wishes. The mission of Beads of Courage is to provide innovative arts-in-medicine programs for children coping with serious illness, their families, and the healthcare providers who care for them. Beads of Courage programs are evidence-based interventions designed to strengthen resilience, alleviate suffering, and improve the psychological adjustment process. 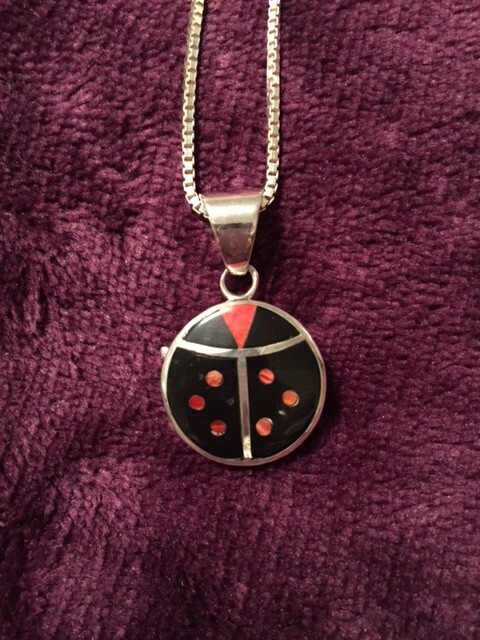 Evine Live jewelry vendor Samuel Benham, fellow tequila lover, you’re a man after our heart. Last night on the home shopping network host Heather Hall was talking about Benham, a courtly man who designs lovely artisan-crafted jewelry. 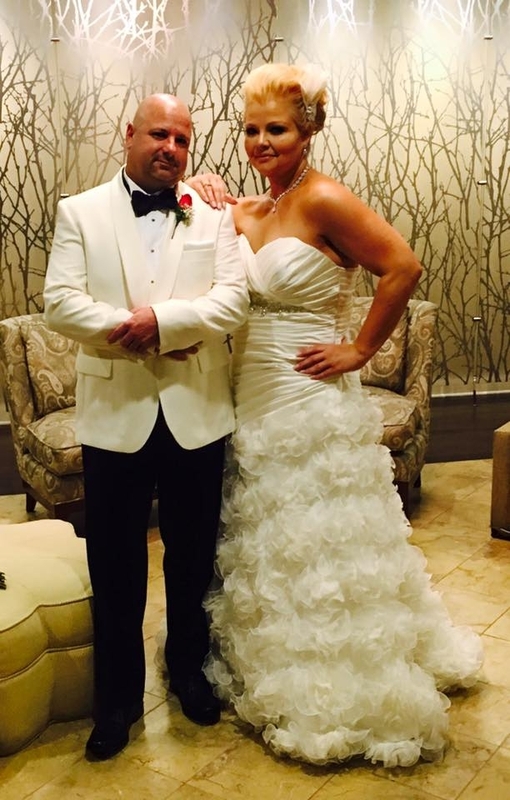 Heather Hall mentioned to turquoise king Paul Deasy that she had gone out to dinner with Benham at the Vegas jewelry show, and he ordered a bottle of expensive tequila. And he apparently enjoyed it. We wouldn’t have guessed that Benham liked snaffing down pricey tequila, so he rose a notch in our eyes. It’s our liquor of choice. And speaking of Evine Live, on the network’s second-quarter call yesterday with analysts CEO Mark Bozek said that the new cookware lines by Paula Deen and chef Todd English are selling extremely well. As you might remember, Deen and English are cast-offs from other home shopping networks. QVC dropped Deen like a hot potato during the controversy over racist remarks she made years ago. And HSN and English parted ways after he showed up in the tabloids inebriated and pawing willing women in public places. Evine Live Inc. saw its net sales rise 3 percent year over year, to $161.1 million in the second quarter, the company reported Wednesday. Those results compared to the 4 percent jump, to $1.4 billion, in the second quarter that QVC posted; and HSN’s net sales increased 3 percent, to $572.3 million. Beauty was the fastest-growing product category at 23 percent, fashion and accessories delivered strong growth of 17 percent and jewelry and watches grew by 1 percent; gains were partially offset by declines of 12 percent in home and consumer electronics. Online net sales as a percentage of total net sales increased 240 basis points to 46 percent. Mobile remains the fastest-growing platform with net sales of $31.3 million, a 41 percent increase year-over-year. Average-purchase frequency rose to 4.5 units per customer, a 10 percent increase. Adjusted EBITDA was $2.5 million. “We are pleased with our second-quarter financial results during this transition year, which were driven by better-than-expected sales. Over the quarter, we executed a more balanced approach to our airtime mix with continued investment in our new emerging brands, coupled with an ongoing commitment to our established anchor brands. Our top-line growth was driven by strong performance in the categories of beauty and fashion and accessories,” CEO Mark Bozek said in a canned statement. * 190 basis points of gross margin percentage decrease was attributable to reduced margins in Jewelry & Watches and Home (excluding textiles) due to merchandising mix changes and a lower than optimal average selling price (ASP). * 30 basis points of gross margin percentage decrease was attributable to continued discounting of excess textile inventory. * 25 basis points of gross margin percentage decrease was attributable to reduced shipping and handling margin. Adjusted EBITDA decreased 54 percent to $2.5 million primarily due to continued gross margin pressure from merchandising mix changes and increased variable costs from lower than optimal blended ASP in jewelry and watches, home, and the continued discounting in textiles. Operating loss was $2.2 million versus $3.7 million in the second quarter of last year. “We are committed to delivering measurable transparency to the market as we execute our plan to drive sustainable shareholder value,” added Tim Peterman, Chief Financial Officer. “American Dreams” kicked off on HSN with the launch of its mini-series event on Sunday, which featured stories of some of HSN’s vendors including Serious Skincare, Benefit Cosmetics, R.J. Graziano, Jay King, GIII, DeLonghi, Violife, Donatella Arpaia and Wakaya Perfection. 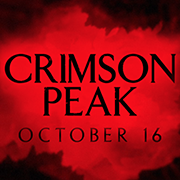 The mini-series event will run every evening at 9 p.m. through Wednesday. HSN’s “The Monday Night Show with Adam Freeman” will devote its first hour from 7 p.m. to 8 p.m. to showcasing three or more entrepreneurs for the first time ever with their new product, alongside one of HSN’s existing partners who discovered them. Bob Circosta, one of television’s first shopping hosts, kicked off the monthly series during last night’s show with three of the entrepreneurs he discovered. Host of “My Cool Inventions,” Akos Jankura, will appear on the next installment of the series on Sept. 7, during “The Monday Night Show with Adam Freeman,” introducing his selection of entrepreneurs to HSN. HSN has also created a landing page and portal for the “American Dreams” initiative where the public can submit and share ideas for products. HSN’s team of merchants alongside the “American Dreams” team will vet these submissions to identify passionate inventors with compelling products to launch. Like a lot of companies in New Jersey, Jewelry Television is looking for a tax break — or so-called PILOT program — from its home state of Tennessee. The Knoxville News Sentinel reported that JTV is asking the Knox County, Commission to give it a tax deal for a property purchase. JTV wants a payment in lieu of taxes, in this case a 10-year deal, to save $1.4 million in tax payments stemming from buying its site and making improvements to its building, namely adding 20,000 square feet of space, according to the newspaper. 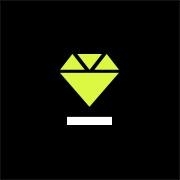 The 24-hour jewelry and gem network is talking about adding 30 high-paying jobs, at $80,000 or so. Where do we sign up? Under the proposed deal, JTV would not pay taxes on the total $42 million to buy the properties it currently leases. According to the News Sentinel, JTV employs almost 1,200 people and has a $59 million payroll. Fun fashion jewelry line BaubleBar — which we’ve seen at Nordstrom — will be debuting a collection on QVC this Thursday at 7 p.m., the home shopping network said Monday. The trendy brand, with its chunky colorful pieces, “is slated to present more than 10 looks that range from stud earrings to over-sized statement necklaces, bracelets and everything in between,” according to QVC’s press release. BaubleBar’s QVC collection will be priced from $32 to $68. The company was founded in 2011 by friends and entrepreneurs Amy Jain and Daniella Yacobovsky. BaubleBar is the first fast fashion brand in jewelry, keeping women on trend at a market-leading pace. Founded by longtime friends Amy Jain and Daniella Yacobovsky, the duo are redefining how women across the globe shop for accessories. Since launching in 2011, BaubleBar has become the first one-stop brand for top-quality, trend-leading fashion jewelry and is defined by unparalleled product selection, a high-touch customer experience and shoppable style guidance. At its core, the company firmly believes aspirational style and accessibility shouldn’t be mutually exclusive. BaubleBar has emerged as the leader in fashion jewelry by pioneering an original sourcing model in the category and creating a brand that celebrates the fun of experimenting with fashion. Looking for an accessories fix? Check out the latest, and largest, selection on BaubleBar.com or look for us at Nordstrom, Bloomingdales, and Anthropologie. We got to eyeball Jewelry Television’s new host, Meg Watters Prewitt, on Sunday night. Prewitt, a pretty young blonde, was teamed with JTV veteran Sharon Scott, who repeatedly introduced the newbie. We couldn’t find Prewitt on JTV’s website as a host, but we located her Facebook page. One of her past gigs was as a spokesmodel for Toyota of Bristol and for Ben Finch Photography. We wish her luck, but and hope she survives the revolving door that this home shopping network has become. Evine Live has started promoted the fact that HGTV and DIY star Nicole Curtis is coming to the home shopping network, announcing that her debut will be on Aug. 28. Born and raised in Detroit, Nicole hails from a long line of do-it-yourselfers. With a remodeling style all her own, she is passionate about reusing salvaged and custom-made materials to ensure each remodel maintains the integrity of the home’s unique architecture. Her exclusive new line of home improvement essentials includes everything from stud finders and hand-held tools to paint sprayers and easy-to-install decorative wallpaper. Turn every “to-do” into “TAH-DAH” with Nicole Curtis Home. We recently reported on Evine Live’s fall lineup, which included the news that Curtis was on the roster. We’ve never seen Curtis’s show “Rehab Addict,” probably because we can barely change a light bulb in our place, let alone try anything more complicated. But we would be interested in buying a stud finder. A key trade magazine for the jewelry industry, JCK, did a story last week about the declining sales of jewelry on home shopping channels. The article, with the headline “Home Shopping Networks No Longer That Interested in Jewelry,” talks about how baubles and gems — which once made up a huge portion of HSN and QVC sales — are not just a small fraction of revenue. The story points out that when the two home shopping networks debuted, jewelry made up about 50 percent of their sales. Now, jewelry accounts for only 9.5 percent of HSN sales and 12 percent of QVC sales, according to JCK. Why the decline? Well, we know jewelry sales were hit hard overall during the Great Recession. Next, when jewelry revenue started to decline home shopping nets gave the category lousy time slots, JCK claims, which also hurt sales and continued the downward spiral. We don’t know if we agree with the “bad-time-slots” argument, by the way. JCK also notes that there was new competition from all-jewelry-all-the-time networks such as Jewelry Television and Rocks TV (which we have never heard of). The trade magazine also claims that more of QVC and HSN sales are being generated online, not a very good forum to promote jewelry. JCK says that millennials are more interested in buying tech items, like smartphones and Apple watches, than jewelry, which is hurting sales. And finally, the magazine claims that home shopping networks have been hard-pressed to replace jewelry lines that were once very lucrative, such as QVC’s Diamonique collection. Someone posted a comment on the JCK story that we also thought made sense: That the once-skyrocketing price of precious metals such as gold really socked jewelry sales. Bragging that it will be the first home shopping network to air a reality show, Jewelry Television said it will be bringing “JTV Rock Star Designer” to its viewers. 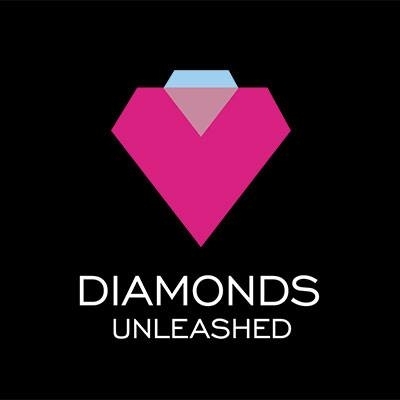 The program is part of the network’s national search for talented jewelry designers, one of whom will win a $5,000 cash prize and the opportunity to design and sell a jewelry collection on the national jewelry and gemstone shopping network. The reality series will debut on today, Friday, at 7:30 p.m., leading into the network’s most-watched segment, “Girlfriend Friday.” There will also be an encore presentation every Wednesday at 2 a.m. beginning Aug. 12. In March JTV issued a call for entries and received applications from designers around the country. The public voted on its favorite entries, narrowing the field to 10 semi-finalists. A team of JTV executives, jewelry buyers and marketing professionals reviewed the work of the Top 10 and narrowed the field to five finalists who traveled to JTV’s corporate headquarters in Knoxville, Tenn., and competed head-to-head in jewelry design competitions. There’s information on the five finalists on the Rock Star site. * Tamara Cimalore – Wilmington, Del. * Alicia Herzbrun – Maryville, Tenn.
* Ashley Hoffman – Myrtle Beach, S.C.
* Kelly Miller – Saint Louis, Mo. “JTV Rock Star Designer” emcee Kristie Carson will present contestants with a series of challenges devised to test creativity, jewelry and gemstone knowledge, design skills, business acumen and ability to work under pressure. One contestant will be eliminated after each challenge until a winner is announced Sept. 25. With the surging popularity in crowd-sourced design, JTV is getting a first-hand look at what emerging jewelry designers are creating and how that merchandise may drive trends and consumer purchasing decisions. “As one of the country’s largest retailers of fine jewelry and gemstones, this is a new way for us to be at the forefront of identifying refreshing new design talent and jewelry trends,” said Johnson. For more information on “JTV Rock Star Designer,” and the contestants, visit JTV.com/rockstar. HSN’s net sales increased 3 percent, to $572.3 million in the second quarter, with strong growth in apparel, accessories and electronics offset by decreases in jewelry (Oh no!) and home, the shopping network reported Thursday. The No. 2 home shopping channel hit Wall Street’s projections for earning per share, but not the forecasts for net revenue, according to the Associated Press. That compares to the 4 percent jump, to $1.4 billion, in the second quarter that QVC posted on Wednesday. HSN’s digital sales were up 11 percent with penetration increasing 310 basis points to 40.3 percent. The return rate improved 70 basis points to 18 percent primarily due to changes in product mix. Units shipped increased 2 percent and average price point increased 1 percent. Gross profit increased 7 percent to $209.3 million. Gross margin increased 130 basis points to 36.6 percent primarily due to favorable vendor settlements and lower inventory-related costs including inbound freight and duties. HSN recorded $3 million for certain costs associated with the planned closure of one of its distribution centers as part of its supply-chain optimization initiative. Excluding non-cash charges and the costs associated with the planned closure of the distribution center, operating expenses as a percentage of net sales increased 70 basis points to 24.7 percent primarily due to increases in bad debt expense and employee-related costs. Adjusted EBITDA increased 9 percent to $68.2 million. Operating income increased 3 percent to $53.5 million. The consolidated results for HSN Inc., which includes the HSN network and the Cornerstone unit, were that net sales rose 4 percent over the prior year to $885.6 million. One-time HSN vendor Arnold Scaasi, a storied fashion designer whose dresses were worn by actresses and First Ladies, died at age 85 On Tuesday. Scaasi was born Arnold Isaacs, but he reversed the letters of his last name early in his career. 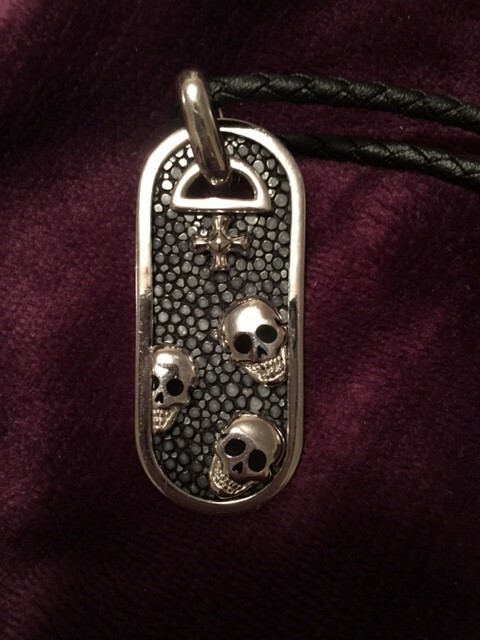 He did a line of costume jewelry for HSN several years ago that was truly gorgeous, and was so inexpensive it was unbelievable. But we blogged about him because whenever he appeared on the home shopping network he was incredibly rude to the hosts, very haughty. We guess that’s because he had made such a name for himself designing clothes for folks such Barbra Streisand, Barbara Bush, Joan Rivers, Joan Crawford and Elizabeth Taylor. The New York Times obit on Scaasi had an anecdote about how the designer lost Jacqueline Kennedy as a customer when he wanted her to pay wholesale for his designs for her, rather than comping her the items for the publicity he would get. Jackie turned to Oleg Casini instead. New York Post gossip columnist Cindy Adams had a great story about Scaasi. We thought we had reported this, but couldn’t find the blog. In any event, comic actress Melissa McCarthy is the latest celeb to come to the home shopping world. The pieces are already online, and we kind of liked them, especially the choice of jeans and pants. The line offers Missy to Plus sizes. One of our reader’s tipped us off the Vogue’s interview with McCarthy about her collection, where she waxes on about how she grew to love jeans and describes her new clothing line. ST. PETERSBURG, Fla., Aug. 5, 2015 (GLOBE NEWSWIRE) — Innovative live content retailer HSN announced today that Melissa McCarthy will debut her first-ever fashion line “Melissa McCarthy Seven7” during a special live appearance on August 13th from 1-3 pm and 9-11 pm, during HSN’s popular fashion program, ‘The List with Colleen Lopez’. The collection is available for purchase today during a special sneak preview on HSN.com. As part of the retailer’s democratic sizing initiative, HSN will carry both plus and missy sizes of the line and will be the only national retailer carrying missy sizes, aside from McCarthy’s own website that launches in late August. 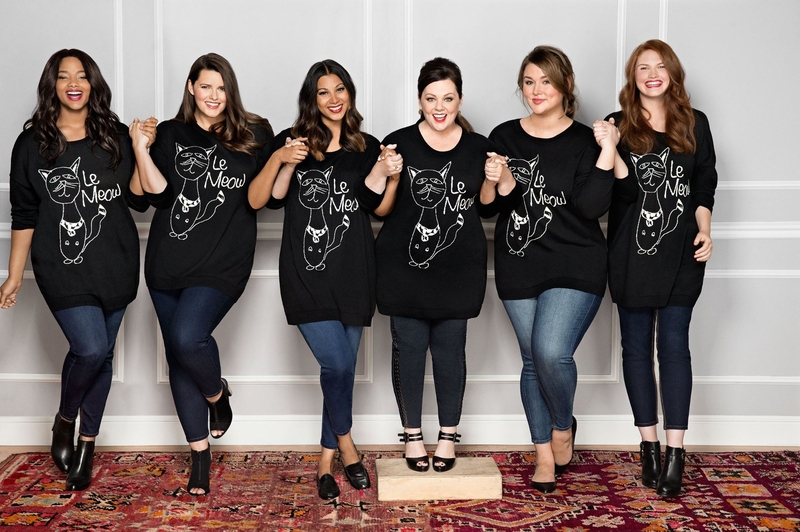 Melissa’s first fashion line combines her enthusiasm for fashion with her understanding of fit and style at every size, to create a comprehensive collection that balances style with thoughtful fit features. Melissa, who went to school for design before getting into acting, is fulfilling her dream with the launch of Seven7. The line, which was carefully supervised by Melissa, from the original sketches to the design of each print, consists of 26 styles in the August Collection. With an assortment of denim, sweaters, tees, woven blouses and ponte bottoms, the line is brought together with vibrant colors, unique prints and modern silhouettes. All denim in the collection features special technology that provides four key fit features: a slimming panel; back lifting darts; forward seam details; and a contoured waistband. QVC’s second-quarter revenue was up 4 percent, to $1.4 billion, from the year-ago period with operating income rising 11 percent, the home shopping network’s parent, Liberty Interactive Corp., reported Wednesday. Units sold increased 4 percent, average selling price per unit increased 3 percent to $58.51 and returns as a percentage of gross product revenue were virtually flat. The U.S. home shopping network experienced growth in all categories except electronics, according to Liberty. E-commerce revenue increased 11 percent to $655 million and grew to 47 percent from 43 percent of total U.S. revenue. The revenue from QVC’s international networks took a hit in the quarter, down 11 percent to $592 million. QVC’s consolidated revenue, which includes its domestic network and its global channels, dipped 1 percent to $2 billion. “We delivered a terrific quarter with strong and balanced results across markets, platforms, product categories and customer segments,” QVC President and CEO Mike George said in a canned statement. “We generated local currency revenue growth and adjusted OIBDA improvement in every one of our consolidated markets,” he said. “Our e-commerce growth accelerated significantly and we continued to extend our mobile penetration. We produced strong margin expansion despite investing in new shipping and handling policies in the U.S. and start-up expenses associated with the launch of QVC France,” George said. Despite the business’ investment in new shipping and handling policies, adjusted OIBDA increased 7 percent to $349 million and adjusted OIBDA margin increased 78 basis points to 24.8 percent. These gains were primarily due to improved product margins, higher credit card income and lower bad debt and marketing expenses, which were partially offset by lower shipping and handling revenue. Want to know how HSN vendors spend their time when they’re not hawking their wares on the home shopping network? Well, fashion designer Liz Lange spilled the beans on her weekends in The New York Times’ “Sunday Routine” weekly column. The 48-year-old has rented a “famed” East Hampton estate Grey Gardens this summer, and is spending long weekends there away from steamy Manhattan with her lawyer fiance, her kids and their Goldendoodle, according to The Times. Perhaps surprisingly, Lange didn’t plug her HSN collection, but did mention her maternity line for Target. The story says that Lange sold her own maternity-wear business in 2007. Guess that’s how she can afford that Hampton rental! She says her favorite eatery is Sette Mezzo, and that on Sunday eves at 10 p.m. she binge-watches TV movies on Lifetime and Hallmark Channel. Now that’s a damning confession. 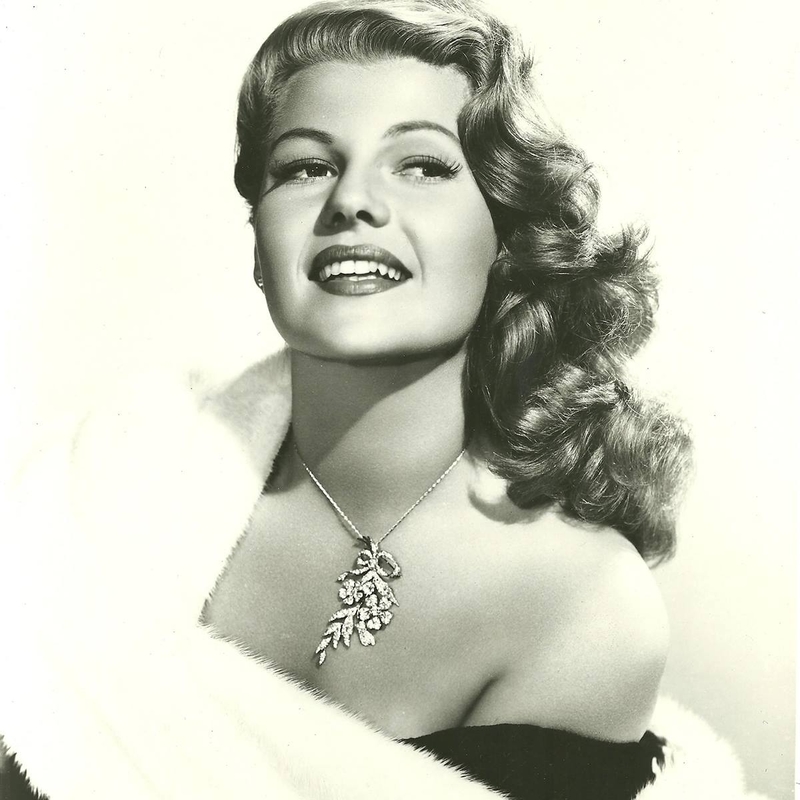 Legendary actress Rita Hayworth suffered from one of the most devastating diseases of our time, Alzheimer’s, and HSN is debuting a jewelry line based on her baubles on Friday to raise money and awareness for this life destroyer. HSN Inc.’s philanthropic arm is partnering with the Alzheimer’s Association for this initiative. In addition to the home shopping channel, other HSN Inc. brands will be participating in this initiative, namely Ballard Designs and TravelSmith. In collaboration with Hayworth’s daughter, Princess Yasmin Aga Khan, HSNi Cares teamed up with the Alzheimer’s group for a 10-day campaign from that is running through May 10 to generate awareness of this disease. The campaign’s centerpiece is a two-hour HSN Cares special Friday at 7 p.m. featuring the launch of the HSN Cares Rita Hayworth Jewelry Collection, inspired by the actress’s classic favorite pieces. 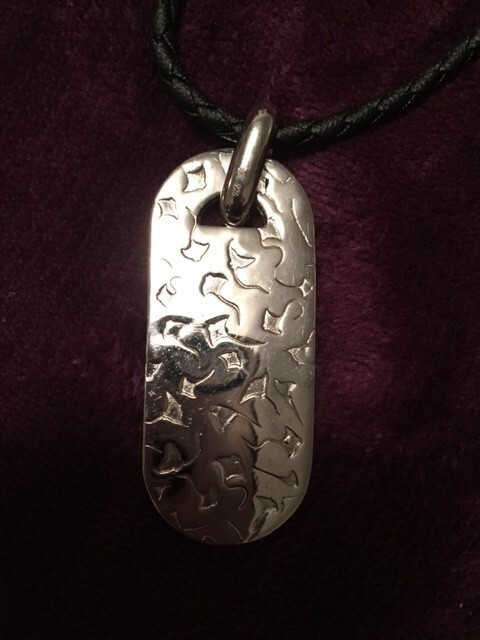 And 10 percent of the purchase price from all items in the collection going to the Alzheimer’s Association. The Rita Hayworth collection features 25 pieces designed with influence from items in Rita’s personal jewelry collection including: a 20.7 carat CZ three-stone engagement ring ($49.95); CZ and cultured freshwater pearl necklace ($199.95); a simulated emerald necklace & earrings set ($159.95); and a 23.75 carat CZ marquis and pave bracelet ($69.95). Princess Yasmin will phone in during the show and to talk about the collection. The charity also chimed in about the collaboration. “The Alzheimer’s Association is proud to partner with HSNi Cares to both raise awareness about Alzheimer’s disease and raise critically needed funds for Alzheimer’s care, support and research programs,” said Maria Carrillo, chief science officer of the Alzheimer’s Association. “With more than 5 million Americans living with Alzheimer’s disease, and more than 15 million people providing care, it is important that we all work together to change the trajectory of this disease and the commitment by HSNi Cares is greatly appreciated,” she said. HSNi brands Ballard Designs and TravelSmith are also supporting the cause by providing their customers the opportunity to make a donation over the phones and online through May 16. QVC Inc. President and CEO Mike George received $2 million in executive compensation last year, up from his $1.2 million in 2013, according to a filing with the Securities and Exchange Commission Tuesday. QVC’s parent company Liberty Interactive Corp. disclosed the information in its proxy statement. George’s comp in 2014 included a $1.1 million base salary and $841,400 in incentives. While 2 million greenbacks is nothing to sniff at, it is way below George’s executive comp in 2012, when it was $18.2 million, but that apparently included stock options that kick in over the years. Manuel, a longtime panelist on “America’s Next Top Model,” offered his tips on makeup application, and talked about how he uses his own products when he’s on the air: Skin Perfector Foundation and Luxe Powder (which is sold out online). No social-media opportunity gets past QVC: The home shopping network has hopped on the Apple Watch bandwagon. Customers can now “engage with QVC content via real-time updates and notifications within the Apple Watch app. Initially available in the U.S., U.K. and Germany, QVC for Apple Watch will sync with and extend the functionality of the QVC app for iPhone,” the network said in a press release last week. 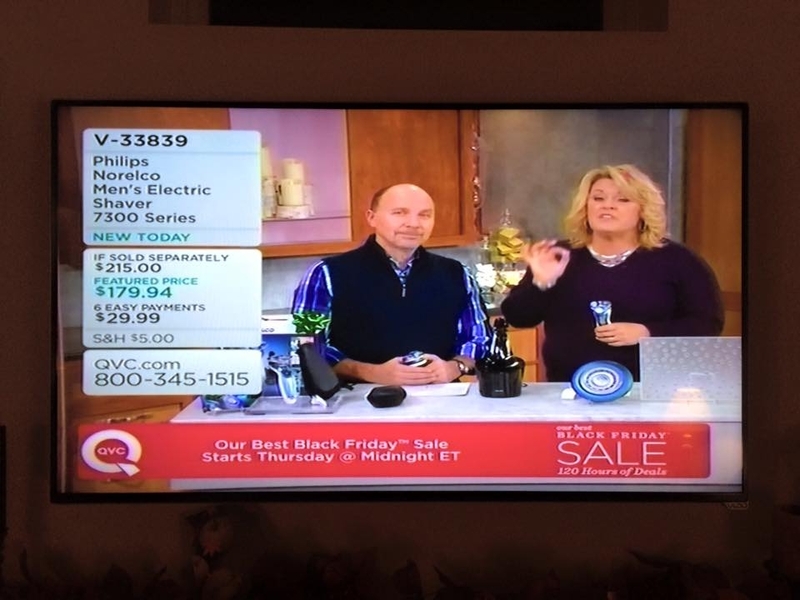 With a tap of the QVC icon (the Q logo) on the home screen, customers can see QVC’s most popular content – the Item on Air, the product currently being shown live on air; and the Today’s Special Value, QVC’s best find of the day. Another tap brings up a close-up product shot with pricing and product details. Customers can then complete their transaction on their iPhone. Additionally, users who opt in to receive push notifications will see real-time alerts of what’s currently on air on the Apple Watch home screen, and will be able to see additional information by clicking directly on the QVC icon. “As wearables continue to serve as an extension of the mobile and tablet experience, the Apple Watch app demonstrates QVC’s commitment to investing in new technologies that deliver a fun, seamless and intuitive customer experience,” QVC Vice President of Digital Content Alex Miller said in a canned statement. QVC for Apple Watch will continue to evolve, offering new features and capabilities over time. Last year, QVC introduced Apple’s Touch IDTM sensor technology for its iPhone app, giving customers the option to log in to their QVC accounts using just their fingertip to authenticate their identity. QVC also introduced enhanced second screen capabilities on the QVC app for iPad, synchronizing products on air to a consolidated product view on the iPad and further establishing its necessity as a companion tool during QVC on-air programming. “The launch of the Apple Watch app is the most recent milestone of our multi-year strategy to build a robust and scalable global technology platform,” said Venkatesh Natarajan, QVC’s vice president of IT commerce platforms. The QVC app for iPhone, iPad and Apple Watch is available for free in the App Store. The Apple Watch app, also available on a user’s iPhone, works with the iPhone 5, iPhone 5s, iPhone 5c, iPhone 6 and iPhone 6 Plus. Say what? So does that mean the whole “investment community” can come, or just a select few? BTW, so far we have not been invited. The dog-and-pony show will be held at the company’s studios in Eden Prairie, Minn., May 28. CEO Mark Bozek will introduce his new leadership team, each of whom will discuss their backgrounds and value creation strategies which the Company believes will drive long-term growth and sustainable profitability. During the presentations, observations may be made regarding the Company’s financial performance and recent developments. Attendance at the Investor Day in person is limited and by invitation only. For further inquiries, please contact Beth McCartan at bmccartan@evine.com. The presentations will be webcast simultaneously and available at http://evine.mwnewsroom.com beginning at roughly 11:30 am EST. Back in the day, we sported clothes by designer Sigrid Olsen. Then her wares disappeared from brick-and-mortar stores. We’re happy to report she’s back on the scene. Olsen has done a collection for HSN. InStyle magazine just did a story on the designer’s HSN line, pointing out her original retail business shut down seven years ago. InStyle writer Eric Wilson, like us, is fan of Olsen. He wrote that when Olsen’s line shut down, she got back rights to use her name and was running galleries where she sold her prints as paintings, as well as organizing yoga retreats. Wilson wrote that her HSN frocks are similar to her original clothes, where she stamped designs on fabric using a cut-out potato. Now living in Florida, Olsen also said that she is doing ageless, comfortable merchandise for HSN. The top price for her clothing appears to be $100. It’s that time of the year, first-quarter earnings. Last week HSN said that it would report first-quarter results May 6 at 8 a.m. Eastern Time before the market opens. CEO Mindy Grossman and COO and CFO Judy Schmeling will hold a conference call at 9 a.m. Eastern Time to review these results. A replay of the conference call can be accessed until May 20 by dialing 855-859-2056 or 404-537-3406, plus the pass code 16764611 and will also be hosted on the company’s website for a limited time. QVC’s parent, Liberty Interactive Corp., will do its first-quarter earnings call May 8 at 12:15 p.m. The first-quarter earnings conference call will be broadcast live via the Internet. All interested participants should visit the Liberty Interactive website at http://www.libertyinteractive.com/events to register for the webcast. Links to the press release and replays of the call will also be available on the Liberty Interactive website. The conference call and related materials will be archived for one year.